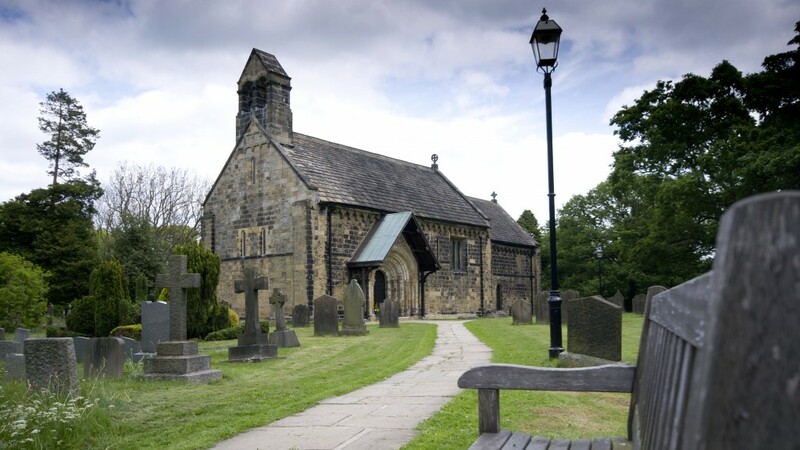 Sarah and Geoff’s wedding was held at the beautiful, historic church of St John The Baptist in Adel, Leeds. St John’s dates back to before 1150 AD and provided a fantastic setting for the wedding party and all the guests. In particular the lych gate and the pathway make a fabulous frame with the church in the background. Geoff was at the church, bright and early and Mark Pearson, the photographer was busy getting some great shots. Anne and I had a chat with the vicar who was very helpful and we managed to find a couple of spots for the cameras where we would have a good angle for the ceremony and not be too obtrusive. The church was going to be full to capacity so we knew it would be a squeeze! After the ceremony we got some good footage outside the church and Mark organised all the friends and relatives with confetti into a line-up both sides of the pathway to the lych gate. 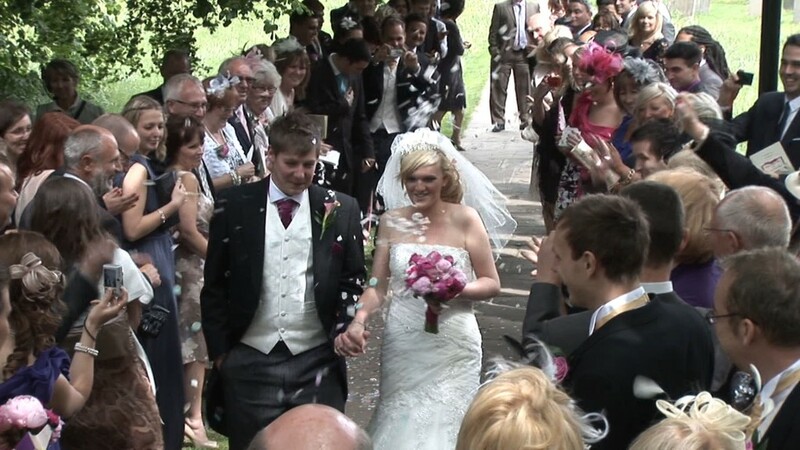 The newly married Sarah and Geoff walking through the throng of confetti-throwing guests made for some spectacular footage! 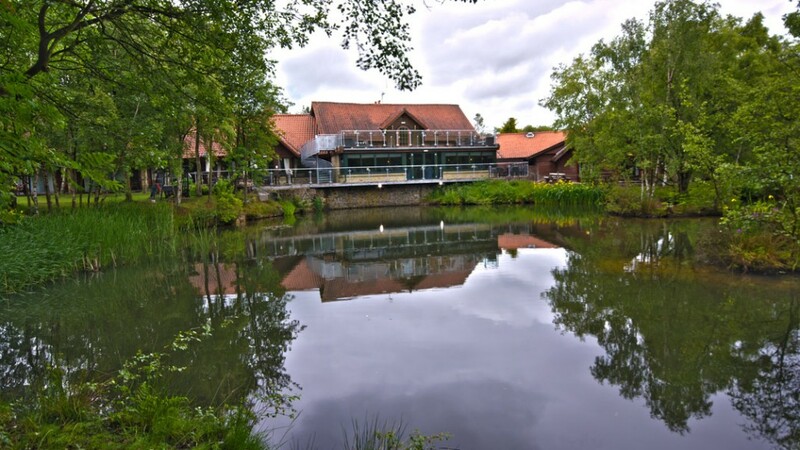 On to the reception at the Chevin Lodge which makes an idyllic setting for the rest of the photographs. One and all had great fun posing for some less-usual photographs and working out which words to say to make the best smiles! After the speeches we whisked the bride and groom off to Surprise View where they braved the wind for a few minutes and gave us some very ‘Wuthering Heights’ looking shots. 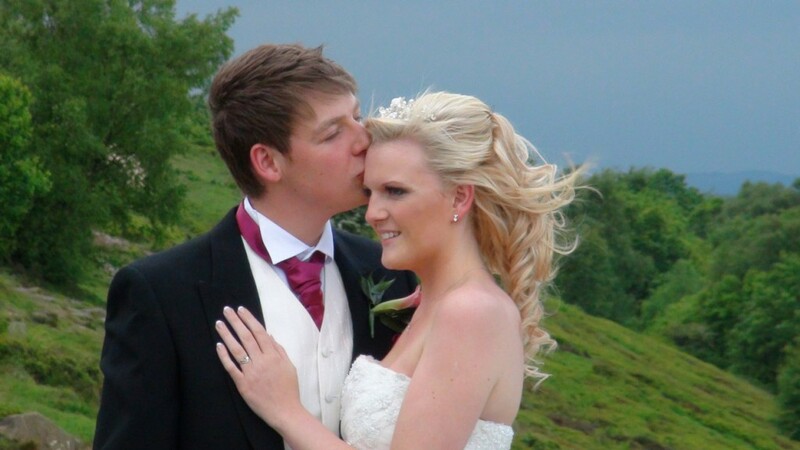 Congratulations, Sarah & Geoff and all the best for your future together from Martyn and Anne at HD Video Services. Based in North Leeds and regularly covering weddings in Harrogate, York, Wakefield, Huddersfield, Bradford etc, we operate throughout Yorkshire and the surrounding areas. If the journey time from the centre of Leeds is more than one hour, please let us know and we will provide a custom price. We will consider covering weddings in any part of the UK or overseas but longer distances will naturally have to include journey and possibly accommodation expenses. Why should I have a wedding video? So many brides tell us that their wedding day passes in a blur. Your wedding video recorded on DVD or Blu-ray disc will allow you to re-live those special moments, see the things that you missed and let friends and relatives at home and around the world share your special day. What will be included in our wedding video package? We always use multiple HD Cameras and two operators to ensure every nuance is captured. All footage is fully edited including titles, montage, credits and DVD menu. A copyright licence will be obtained from PPL/MCPS specifically for your wedding. This allows you to choose your favourite tracks to accompany the video on DVD or Blu-ray disc. All weddings include three DVDs or Blu-ray (your choice - no extra for HD). All discs are supplied in custom cases. Why should I choose H D Video Services? We have over 20 years experience and many testimonials to prove the quality of our work. With professional HD cameras and through the use of cinematic techniques and equipment, your finished wedding video will really stand out. We are videographers in Leeds, Yorkshire, producing high quality, cinematic, wedding films in hi-definition on Blu-ray disc as well as SD DVDs. Please mention dates and places in your enquiry where possible. Copyright © 2019 H D Video Services. All Rights Reserved.